Genetic traits: Artrell are generally very nimble, but due to their frail appendages, they have a low pain threshold and are not incredibly strong. Most races find artrell insectoid appearance unattractive. They are of average intelligence and wisdom. 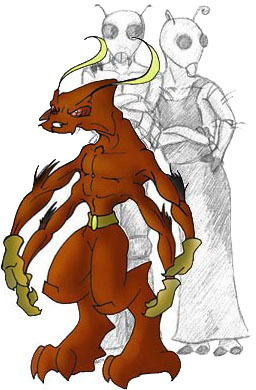 Physical description: The artrell is a humanoid creature with insectoid traits. Particularly demonstrating these insectoid traits are their heads, arms, and hands. They have larger than normal eyes placed upon a face with skin of some thin membrane type tissue. They have a small beak for a mouth. Their four arms are very thin and frail in appearance with long, thick black hairs growing from them. The hands end in two plier like fingers. For the most part, their torso and legs are fully human-like, except the black hairs like the arm hairs which grow on the legs. Their build is short and very thin. They have leathery black skin and no hair.